Yes...the Beltway express lanes end well before the Springfield Interchange. 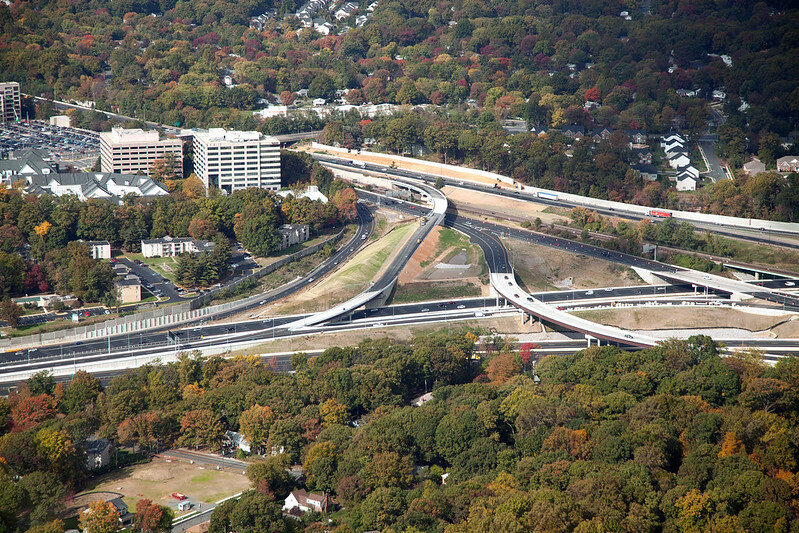 Not exactly - it will be possible to navigate through the Springfield Interchange while staying on the toll lanes in both directions on the Capital Beltway. The lanes will not extend north of Turkeycock Run (at the Fairfax County/City of Alexandria border, thanks in large part to objections raised by Arlington County). Well, yes and no. I wrote into the project managers to ask about the ramps to/from Shirley Highway and they confirmed that there is no toll to use them. I was wondering about it because of the toll gantries located just to the west of those ramps and because "froggie" of this forum had said that the HO/T system will extend east through the Springfield Interchange, although the project's website says the toll system ends where the Express Lanes begin/end to the west of the Robinson Terminal. The project team said the ramps will be untolled, although as Mapmikey points out the eventual conversion of the portion of the Shirley Highway HOV lanes to which those ramps connect will mean that traffic will be unable to use those ramps without paying a toll somewhere (unless you're an HOV). I've tried to find out why there are toll gantries there if there is no toll but I haven't gotten a straight answer. Dr. Gridlock seems not to have any interest in that part of the project. What's odd, though, is that new lanes built by the HO/T project extend east through the Springfield Interchange even though (a) there is to be no toll there and (b) there are no plastic bollards separating them from the general-purpose lanes. On the Inner Loop, for example, if you take the new left exit for the HOV ramp, you'll see the sign shown below (the ramp in the background with the truck driving uphill is the I-95 South flyover). Notice the BGS for the Beltway. It doesn't have the "E-ZPass Express" banner all the HO/T signs are required to have. The lane to which it refers curves back to the right and becomes the left lane of the Beltway, passing under a toll gantry at the west end of the HOV ramps (where there is to be no toll collected). I suspect the idea is that eventually they might want to extend the system eastward and they've constructed this part of the system as a provision for that in the future. And/or maybe (this is pure speculation) the HOT lanes project included the implementation of an ITS and they're using an E-ZPass reader to measure traffic flow. And/oryt maybe (this is pure speculation) the HOT lanes project included the implementation of an ITS and they're using an E-ZPass reader to measure traffic flow. I believe that all of the E-ZPass reader stations along the project also have inductive loop detectors under the gantries (not certain about this, since I have not been able to get a good look at the pavement). The toll collection gantries on Md. 200 (ICC) have loops in the pavement beneath them. EDIT: Upon further inspection (yesterday), there are some sort of detectors in the blacktop below the E-ZPass transponder readers. Not sure how they work (they appear not to be the traditional loops (usually circular in Virginia, sometimes a square tilted 45° (rather like the North Carolina state highway shield)), but are almost metallic "strips" mounted across both lanes). 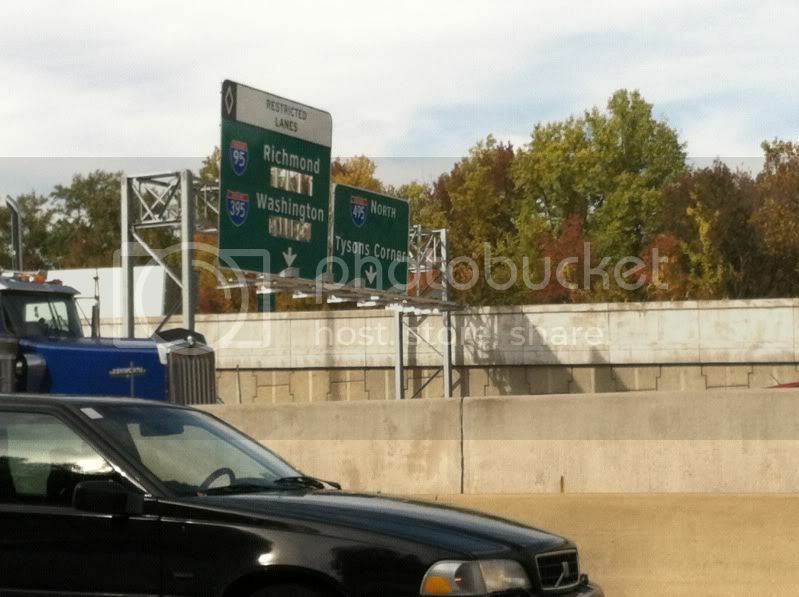 I keep seeing signs for E-ZPass along both sides of Interstate 66 between Arlington County and the Nutley Street exit. What does this mean, and how it does it affect me? I am not a commuter. I use I-66 only occasionally to go into Arlington from Fairfax County and return. Can I still use I-66, or will I have to purchase an E-ZPass? It's interesting to note that the identical sign on the Dulles Access Road has an I-495 shield at the top above the "E-ZPASS EXPRESS" banner (and it's a bit of an odd-looking shield in terms of not having any kind of background—it's a cut-out centered above the "E-ZPASS EXPRESS" plaque). I wonder why they didn't do something similar with the signs on I-66. The added cost would have been negligible. Either way, I can't begin to fathom that someone from Fairfax is unaware of the high occupancy/toll project on the Beltway, yet her letter implies that she claims ignorance. That project has been perhaps THE central fact of transportation in Northern Virginia for the past four years as the Beltway has been rebuilt, and it's regularly mentioned on the news and on the traffic reports. You'd really have to be making a serious effort to avoid knowing about it. But seeing her letter makes me think that the fact that she wrote into Dr. Gridlock indicates that she must have at least some minimal knowledge of traffic and transit issues—after all, presumably she reads his column and so knew where to write, correct? That makes me wonder how many people there are out there who are even MORE ignorant. Eastbound I-66 is going to be pretty darn interesting during the morning rush hour for awhile as people get used to the new setup. You'll have HOV-2 drivers who used to use the left exit who now must exit to the right if they don't want to pay the toll. While that's the same as it's been for the past month or two of construction, you now have a new twist: Single-occupant vehicles who now want to move LEFT to use the left-side exit into the Express Lanes because they're willing to pay the toll. Having criss-crossing traffic like that doesn't strike me as a wonderful situation in an area that's already congested (and eastbound I-66 at the Beltway has been heavily congested every morning for at least the past 20 years). Meanwhile, you still have people asking questions like whether the HOV-or-toll restriction will be in effect 24/7 (it will)—they seem to think that at non-rush hour it will be free for all. BAD SIGNS. My sister from Philadelphia wanted to exit on 66W from the beltway today, and the signs kept telling her to exit left, which of course she couldn't do, so she missed the exit completely. There is NOTHING on those signs that indicate that the left 66 exits are for HOT lanes only. This needs to be fixed ASAP. So I kind of shake my head at the ignorance out there and I wonder how it's all going to work next week when this is open on commute days for the first time, though perhaps the following week might pose more of a valid test because next week many people may be out of town for Thanksgiving. I think I may test it out on Monday when I need to make a trip to Potomac, though I'll likely wait until after rush hour just to get a lower toll. 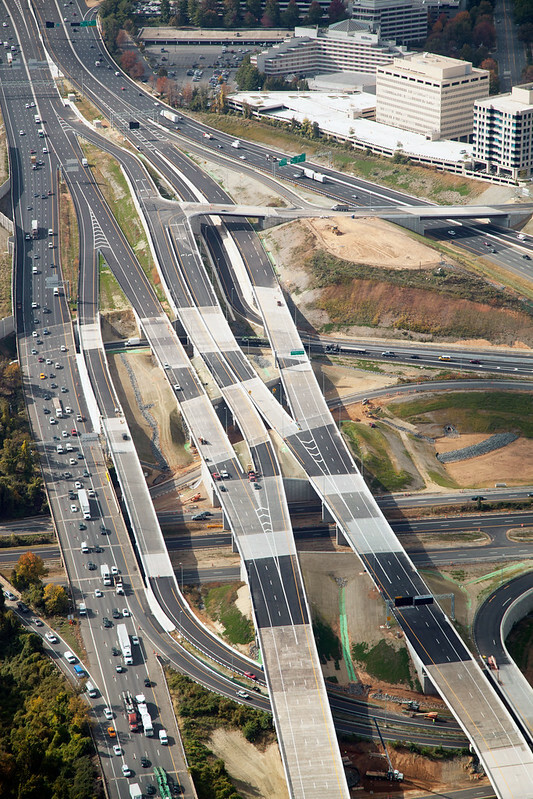 Overhead pictures of the Dulles Toll Road/Beltway interchange from VDOT (taken on October 16). This is the sort of thing I thought should have been posted on the 495 Express Lanes website. Useful stuff for helping you visualize exactly where some of the ramps go—for me, the hardest one to picture at that interchange was the one from the eastbound Toll Road to the southbound Express Lanes. In this image, south is at the top of the map—the Inner Loop is on the left with the traffic. The two overpasses towards the top right are the new Jones Branch Drive exit. This image is from further west than the first but still looks south. The one-lane ramp from the Toll Road to the southbound Express Lanes runs next to the stopped traffic on the other ramp (leading to the Inner Loop) and it surfaces to the left of the Express Lanes but to the right of the ramps to/from Jones Branch Drive. I-66 interchange here (I-66 crosses the picture with west being at the top left). What I find amusing is that the new Express Lanes ramp from the Inner Loop to westbound I-66 essentially restores the original left-side exit that had been re-routed in the mid-1990s. Dr. Gridlock's blog has this very grainy photo, I assume taken on a mobile phone, looking north towards the Dulles interchange and the end of the Express Lanes. I post it here because I find it interesting that there are no exit tabs for the Express exit to the Dulles Access and Toll Roads. 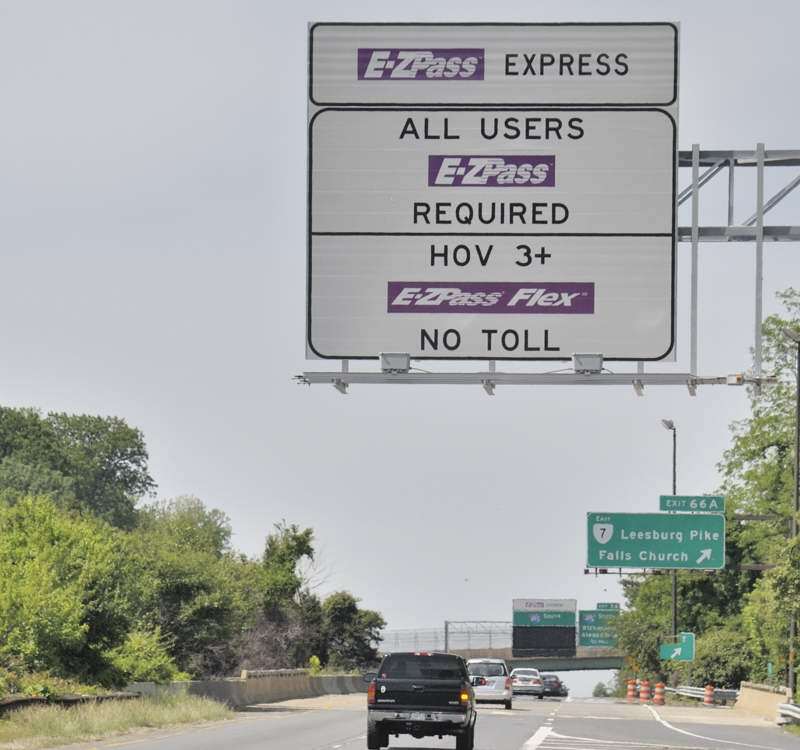 I suppose, when you get down to it, the white "E-ZPASS EXPRESS EXIT" banner serves the functional purpose of a tab and that the only reason the other exits have tabs is to comply with the new standard of having a yellow notice for a left exit. BTW, I have to say the HO/T project has resulted in much better signs for that particular interchange. For so many years the BGS for the westbound toll road never said anything at all about where the road went, just "267 WEST/TOLL ROAD." Though I do find it amusing that Leesburg is not listed, as the road ultimately goes there. I wonder if that might be a political thing to do with the privately-owned Dulles Greenway. What's with some of the TOLL boxes being white? Huh, good catch. Interesting. All the TOLL boxes on the old signs were in white, so someone probably just did the same on those particular new signs. 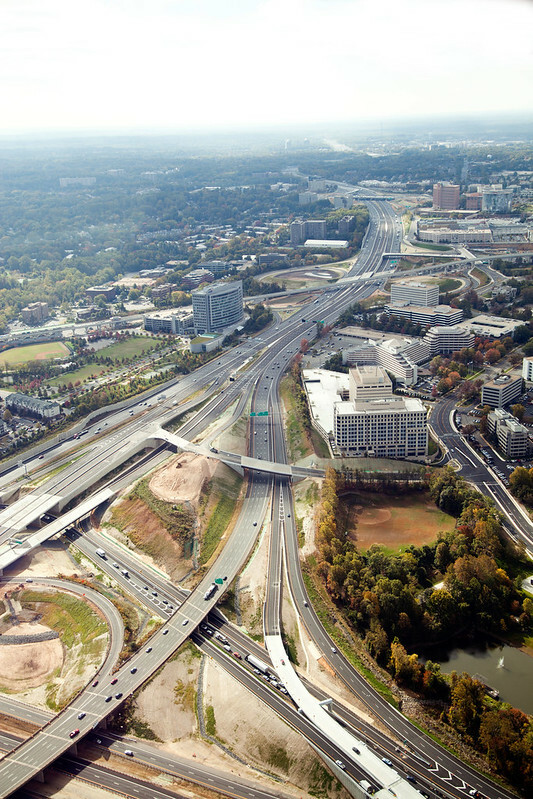 One of the nation’s best-known highways is getting a makeover for the 21st century. Early Saturday, a new set of lanes is set to open on the Virginia side of the Capital Beltway, and it’s not just new asphalt. 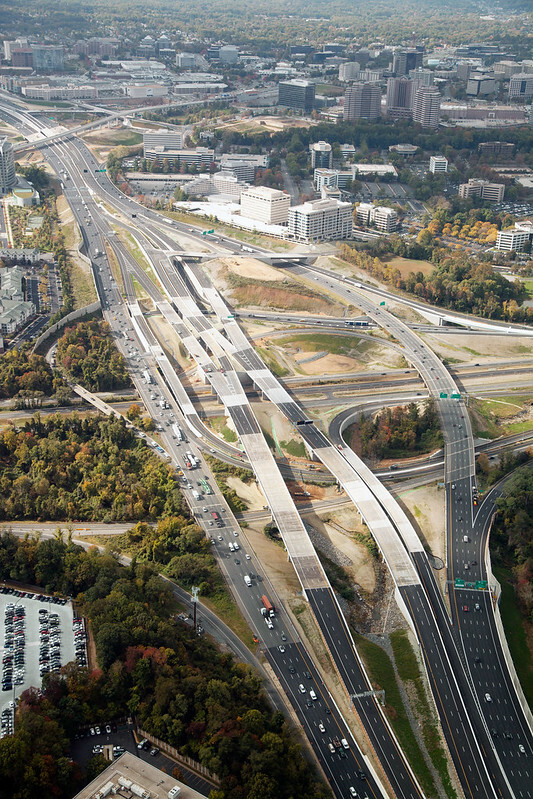 The 495 Express Lanes represent a new approach to paying for highways and managing traffic. I notice one of Dr. Gridlock's latest items references that website you frequently link and some others complain about, TollRoadsNews. Hoo, that's correct. Like him or not, Peter writes good and informative stuff on his site. And unlike some others, he appreciates comments and corrections from his readers. Yeah, and there used to be LGSs for Reston and Herndon when they weren't on the main signs. I thought their omission from the main signs was odd too. Here come the Beltway HOT Lanes — you ready? The world is watching. Or at least the world of traffic engineers, and the world of drivers that swirls through Northern Virginia on the Capital Beltway every day. The High Occupancy Toll lanes open Saturday between the Mixing Bowl and the Toll Road. It will almost be strange not to have the construction on the Beltway anymore. But I’m sure Metro’s work around Tysons, followed by the construction of Tysons City, will keep things in a mess there. We had an HOA meeting last night and two of the local elected officials (Supervisor Jeff McKay and Delegate Mark Sickles) put in an appearance. The HO/T lanes were one of the major topics of discussion during their portion of the program and the discussion underscored to me just how much of a learning curve there will apparently be as to the public. Several of the people who asked what I'd consider to be somewhat silly questions are people who are, on the whole, pretty well-informed (one of them is the HOA president), but they didn't seem to understand some fairly basic points, such as the new lanes being HOV-or-toll on a 24/7 basis and not just during rush hour like the Shirley Highway lanes are now. It makes me think people must (a) just make assumptions about how the project will work and (b) accept misinformation from other people as fact, and in both cases (c) they don't bother to do the minimal research to find out whether the information is accurate. Gonna be interesting to see how it all works. The feeling I sensed in the room is that the I-95 Express Lanes project concerns people in our area a lot more, which is understandable because a lot of us use those reversible lanes during the non-HOV hours. If we're coming from the south on a Sunday, it's a lot easier to reach our neighborhood from the HOV lanes than it is from the general-purpose lanes, and people were quite dismayed to realize that in the future they'll have to pay to continue in the express lanes from Turkeycock to the Franconia–Springfield Parkway (whereas nowadays they just have to wait until after 6:00 PM when HOV ends). The other thing I found myself thinking: Understanding the Beltway Express Lanes, and the tolling mechanism, is a very simple matter compared to what people will encounter on I-95. I'm sure I've noted it before in this thread, but because the I-95 lanes have ramps that allow you to exit back into the general-purpose lanes, your toll is not locked in for the entire length of the trip when you enter (whereas on the Beltway it is). Instead, if you enter at, say, Potomac Mills Mall, you'll see the toll to the flyover ramp just north of the Fairfax County Parkway. As you approach that ramp, you'll see a separate toll to Turkeycock and you'll have to decide whether to pay that toll or whether to exit into the local lanes there. That's not an issue on the Beltway because you cannot exit into the local lanes. People are going to assume—quite understandably—that the two projects will work the same way. As usual with those articles, don't read the reader comments at the bottom unless you want to feel your intelligence dribbling away. My property in the Fairland Master Plan Area of Silver Spring, Montgomery County adjoins the Maryland 200 (ICC) and U.S. 29 (Columbia Pike) interchange. We have had an assortment of people out to speak with the HOA dating back to the early 1990's (when the environmental impact statement study that was ultimately scuppered by then-Gov. Parris Glendening was getting under way). In spite of that, when the Contract B/Contract C section of the road finally opened in November 2011, and in the year since then, I have gotten a lot of questions about the road, which indicate that people were (and still are) remarkably uninformed about where it goes and how the tolls work. That tells me that persons and groups in favor of a project have not done an especially good job of informing the public (and goodness knows, they have tried). Certain elected officials in Arlington County have done the region a huge disservice by forcing this change to the project (though it also means that non-HOV non-peak period travel from Turckeycock Run to the Pentagon and D.C. will remain "free" for the time being). Regarding access to your community, has anyone asked their elected officials if there is any prospect of building those ramps from the mainline of I-95 to Va. 289 (Franconia-Springfield Parkway)? I am pretty certain that there is no money for them, and because there are effectively "frontage" roads on both sides of I-95 near there (Va. 789, Loisdale Drive on the east side and Va. 617, Backlick Road on the west side), ramps like that would be extremely expensive. I went to Tysons earlier today. Got stuck in hideous traffic on the way back and was gazing longingly at those Express Lanes. I eventually got off at US-50 and took a different way home. I did note that all the signs are uncovered with the exception of one on the Outer Loop in the Springfield Interchange to the east of the HOV ramps where a single lane splits off to the left only to rejoin the Outer Loop at the eastern end of the I-95 flyover (this is the peculiar lane whose purpose nobody seems to be able to explain). I saw a lot of the types of trailblazers shown in the picture below (this one is at the ramp from westbound 50 to Gallows outside the Yorktowne Centre; the northbound Express Lanes entrance is from Gallows and the southbound one is from Lee Highway). Lots of these in Tysons, especially (I made several stops in the Tysons area and so drove around a fair bit). Smaller versions of the white signs explaining the E-ZPass requirements are posted on the arterial roads too. The significant thing that is not present anywhere is a sign on the Beltway prior to the lanes' southern end (I assume the same is true on the Outer Loop, but will find out for sure on Monday) telling you where the exits are—something similar to the sign at the southern end of the I-95 HOV carriageway that says "EXITS FROM RESTRICTED LANES" and then gives the mileage to Springfield, the Pentagon, and Washington. I guess the idea is that the signs giving the toll rates help tell you where the exits are. We'll see! The sign at the exact southern entrance has the white "E-ZPASS EXPRESS" banner and then underneath it just a simple green panel that says only "ENTRANCE" with two downward-pointing arrows for the two lanes. Seems like that sign could have said "Merrifield" and "Tysons Corner," perhaps. Well, it will be interesting to see it in practice! I don't think that's the entire problem because no matter how hard you try, you can't inform people who are unwilling to be informed. Read some of the comments on Dr. Gridlock's blog and you'll see what I mean. A lot of those lunkheads are still arguing that the lanes shouldn't have been built, which is a really stupid fight to be trying to make now! Not recently. The current supervisor's predecessor (Dana Kauffman) mentioned it once and said not to hold your breath. It's not just the cost of the construction of the ramps themselves. There are also eminent domain issues due to private businesses butting right up against I-95 on the west side, and the Virginia constitution was just amended to make eminent domain proceedings more difficult. There's also the problem that you'd be squeezing in a new interchange adjacent to an existing one (Route 644) and so you would almost definitely have to build C/D roads, thus further increasing the cost and the construction mess (in a place that has seemingly been under construction at least since 1990). What I'm interested in seeing is how many people get addicted to using the new Beltway-to-HOV connection as a shortcut to and from the Franconia–Springfield Parkway. For example, suppose I park the car at the Springfield Metro and ride somewhere and then someone drives me back to the car. If we're coming down the Beltway at night, it becomes way easier to take the HOV ramp and then exit onto the Parkway instead of exiting onto I-95, then exiting onto Franconia Road, going through two lights, turning onto Frontier Drive, and going through five more traffic lights! Stuff like that makes me think more people in my area might become willing to pay the toll for that short segment than now think they'll do that. I don't think that's the entire problem because no matter how hard you try, you can't inform people who are unwilling to be informed. Though they consider themselves to be "informed" (I use that word loosely) enough to complain about "traffic" and why it is so bad. Read some of the comments on Dr. Gridlock's blog and you'll see what I mean. A lot of those lunkheads are still arguing that the lanes shouldn't have been built, which is a really stupid fight to be trying to make now! Heck, at the two ribboncuttings for the ICC (Contract A in February 2011 and Contracts B and C in November 2011) some of the same people that have been raising objections to the road since the 1980's (and maybe earlier) were there to complain. At the Contract A ceremony, at least one or two were informed to cease their activities (attempting to disrupt/shout down the several speakers, mostly elected officials) or be arrested by the numerous MdTA Police who were present. I don't think anyone actually was arrested, though it would have been incredibly amusing if the very first arrest made by the MdTA Police in Montgomery County was of an anti-ICC protester. Agreed regarding the challenges of building those ramps, but I understand that still more jobs may (at some point) be coming to the Fort Belvoir North Area, which (in addition to everything else that's happening) is going to increase the load on the I-95/Va. 286 (Fairfax County Parkway) interchange at Newington. Maybe that will push those ramps along in spite of their cost (though I don't think they are in the TPB's Constrained Long Range Plan now) (TPB is the designated metropolitan planning organization for the Washington metropolitan area). Regarding the Virginia Constitution, I thought that amendment forbade the Commonwealth and its political subdivisions from using eminent domain to condemn and purchase land for private entities (in other words, for "economic development"), but still allowed it to use those powers for public purposes (such as highway construction and improvement)? Wasn't it a reaction to the (U.S.) Supreme Court's Kelo decision? I think that's a very good question. For the most part, the reversible nature of the I-95/I-395 Express Lanes works well in that corridor, but this is one place where it hurts, since I think there is demand in both directions most of the time, which the reversible configuration cannot handle. Before the Springfield Interchange reconstruction was completed, I talked to people that would go north from I-495 on I-395 to Va. 236 (Duke Street), then turn around and enter the Express Lanes southbound at Turkeycock Run just so they could use that exit from the Express Lanes at Va. 289 (f/k/a 7900). That's been a few years now, but I think it may be a (small) indicator of how popular that movement might be. It is a reaction to that case, but my understanding is that the amendment goes further than what you state because it requires compensation for more than just the value of the land—there also has to be compensation for things like lost income/lost profits. That makes it a much more complicated equation. Wow. That's one move that's never crossed my mind, but then it wouldn't because I live closer to Van Dorn Street. Also, the Duke Street interchange is absolutely horrid and I avoid it whenever possible. Still, that's wild to hear that people use it as you've just described. Those new HOV ramps (the former "Phase VIII" of the Springfield Interchange) have really been completely overlooked in the media coverage of this whole thing, and I think that does a disservice to a lot of people. Those ramps make it possible for the slugging system to grow to serve Tysons Corner and Alexandria because it eliminates the nuisance of exiting the HOV at Newington and fighting everyone else through Springfield. It may take quite some time for slugging to develop, especially seeing as how the slug community are some of the most vehmently against HO/T projects because they think drivers won't want to pick up slugs anymore (a stupid theory: Why would any sane person pay a $15 or $20 toll to be an SOV when he can ride free if he picks up slugs like he has for years?). Thank you. Not being a resident of Virginia, I had not read the (now-approved) amendment in any detail - I was relying on what the media said. However, let's look at the provision for lost income and profits from the flipside. Maybe it will mean that someone who has property that is needed for a legitimate public use is more-likely to come to agreement with the public agency that needs the land with such provisions in place? I have long felt that governments should be able to offer slightly more than appraised value of real property that it wants to purchase by eminent domain. I don't think it will significantly increase the cost of a project, and it might allow things to go to settlement much more quickly. Not a scientific sample, but recall how terrible traffic was before the Springfield Interchange was reconstructed (and the additional lane added to I-95 between Va. 286 (7100 then) and Va. 123 in Prince William County during the peak P.M. commute period)? Looping around at Duke Street was a method to avoid all of that mess. Agreed on all points above. Those new ramps are a huge improvement for drivers wanting to get from southern Fairfax County and eastern Prince William County to employment at Tysons Corner and along the Dulles Toll Road corridor. The slugs and body snatches are indeed unhappy about the new projects, though I agree with you - I don't think their fears are justified, and the new lanes on the Beltway may indeed open up some new slug line markets. The significant thing that is not present anywhere is a sign on the Beltway prior to the lanes' southern end (I assume the same is true on the Outer Loop, but will find out for sure on Monday) telling you where the exits aresomething similar to the sign at the southern end of the I-95 HOV carriageway that says "EXITS FROM RESTRICTED LANES" and then gives the mileage to Springfield, the Pentagon, and Washington. I guess the idea is that the signs giving the toll rates help tell you where the exits are. We'll see! The sign at the exact southern entrance has the white "E-ZPASS EXPRESS" banner and then underneath it just a simple green panel that says only "ENTRANCE" with two downward-pointing arrows for the two lanes. Seems like that sign could have said "Merrifield" and "Tysons Corner," perhaps. 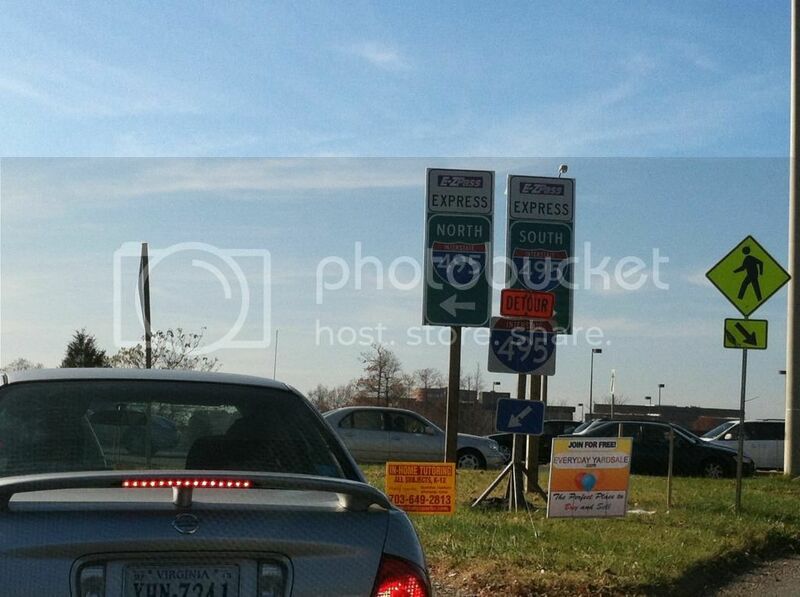 On the outer loop there is a sign before the HOT lane entrance with the first 3 exits and distances to them. Interesting, thanks for the info. Maybe a similar sign will go up tonight on the Inner Loop. I'll find out tomorrow, got to go drop off some stuff at my parents' house. But on the other hand, the first three Outer Loop exits come up very quickly and are in the core area the project is meant to serve (Tysons), so maybe it'll stay the way it is.